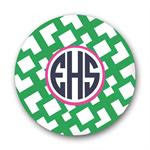 A huge thank you to Elizabeth at Crocodile Kids for sponsoring the Prepppy Plates giveaway! I'm thrilled to announce that DSS at Desperately Seeking Seersucker is the lucky winner of this giveaway! Please contact me so that I can put you in touch with Elizabeth to choose your prize. Remember that all the Lilly Pulitzer Stationery & Gifts are now 30% off at Crocodile Kids. As a thank you to Maryland Pink and Green blog readers, Elizabeth is offering 15% off of your entire order! You can also use the code MARYLAND at checkout to receive the discount. Remember that there are two other giveaways happening on my blog right now! It's been such an exciting week at Maryland Pink and Green. Have a chance to win a small Originals tote from Lilly Pulitzer here and help me celebrate 100 wonderful followers. This giveaway ends on Sunday, January 17 at midnight. Read Maryland Pink and Green's interview with Social Climbers author, Beth Dunn, here and enter to win a copy of her book. Wishing all of my wonderful readers a very happy Saturday! Thanks for reading. XOXO have a great Saturday!